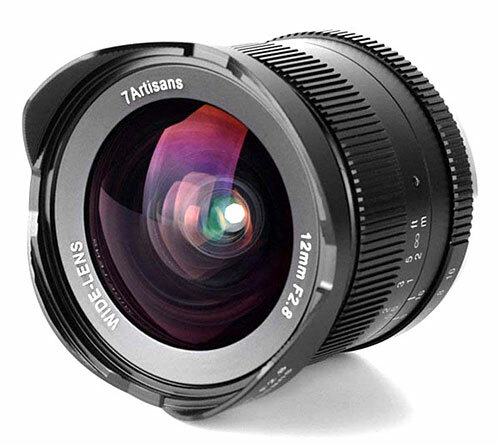 7 Artisans has been around for a bit more than a years providing very affordable manual single focal length lenses for Fuji, Panasonic, Canon, Sony, MFT and other mounts. I have owned two of them in the past and this one is my third. The first two were the 25 and the 7.5 fisheye. The Fisheye is actually quite good, providing a 180 degree field of view across the diagonal of the frame with a curvilinear rendering. My enthusiasm for the 25 was more restrained as I found the one I received to be a bit softer than I could tolerate. I ended up selling it. Fuji a couple of truly great 25's. I was bit concerned about the 12 because it is a lot harder to design than a 25. Both Fuji and Zeiss make outstanding 12's but they are pricey enough that I never bought one. The 7 Artisans is only $150 on Amazon. Like the other lenses from this company the 12 features a metal body, multicoated glass and a built in lens hood. It is a manual lens. That means no electronics and that means no auto focus and manual or aperture priority only metering. It is well built old school. The brass focus helicoid allows the lens to be racked back forth smoothly. The aperture ring, like the other products from this company, has no detents. It doesn't click into each full f stop. How does it perform? Pretty well, actually and better than the 25. It is soft at f2.8. I mean soft in the center of the frame as well as the edges. It is acceptable at f4 and crisp by f5.6. Recitlinearity is surprisingly good You can put a straight line on the edge of the frame and reproduce it straight as an arrow. 20 years ago I spent a small fortune on the Nikkor 18mm f2.8 super wide. I did it because it was the only truly rectilinear super wide lens I had ever encountered. That capability is now available for $150 in the 7 Artisans 12. It has about the same field of view in APS-C format as that Nikkor 18 produced on a 35mm camera. Should you buy one? You bet, as long as you understand its manual nature and its poor performance wide open. Fuji X cameras have excellent manual focus aids so you won't have any problem using it in the field. Heck, it's only $150. Some people spend more than that on a filter.